3-Minute excerpt from original "Desecration" 23 minute short film. 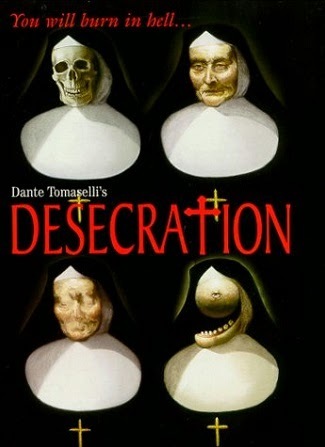 "Desecration" is an independent horror film written and directed by New York filmmaker Dante Tomaselli. Mr. Tomaselli has created a hypnotic, dream-like tale of psychological and supernatural terror. Several qualities set this film apart from countless other demonic films. Mr. Tomaselli wrote a unique script which tells a story you haven't heard before. Mr. Tomaselli also produced stunning visuals which build, scene by scene into a very disturbing nightmare. As is the case in many independent movies, the acting leaves something to be desired. Do not, however, let this shortcoming deter you from sticking with this movie. The end result is well worth your trouble. Bobby (Danny Lopes) is a troubled teenager attending a strict Catholic school. His mother died on his birthday when he was small. His father is an overbearing lug who hates the memory of Bobby's mother. Bobby's grandmother is a devout Catholic. She seems to be the only person in the movie who has real faith. This is ironic considering the number of priests and nuns which populate this movie. As the film opens, Bobby's radio controlled airplane goes out of control and skewers a nun's cranium. This death sets of a series of events which might be real or might be figments of imagination from Bobby's troubled psyche. The less said about this story the better. I say that out of respect for the film. Mr. Tomaselli has created a personal and troubling film which deserves to be seen fresh. Regular readers know that I am a huge fan of Mario Bava and Dario Argento. Mr. Tomaselli seems to be also. He uses colors to create atmosphere with excellent results. I was reminded of Mario Bava's "Blood and Black Lace" as I watched "Desecration." Many of the film's more striking moments are bathed in vivid, rich reds, blues and greens. There is a scene in which the teenaged Bobby is caged and tormented by the spirit of his dead mother. The scene stands along side the best of many more seasoned directors. Gore fans may be somewhat disappointed as there is only one scene which delivers Lucio Fulci style gore. I liked the fact that there was only one scene which resorted to this type of horror. The scene, which involves a nun being attacked by a pair of floating scissors is all the more powerful because it is the only scene of graphic violence. The scene in which the nun is impaled by the flying toy airplane is sort of bloody, but it is also the weakest point in the movie. The effect is laughable. I almost stopped watching at that point. I'm glad I stuck with it. I hope you take a chance too! Very good horror film. Very stylish. Good picture and sound. Lame menu. The one extra is good, but overall, no extras. A bit pricy for a vanilla DVD, but still worth it for horror fans. The film was shot on 16mm. I was unaware of this until after I watched the movie. A very good picture. There is none of the graininess one would associate with 16mm film. The colors are vivid and rich. Flesh colors wash out occasionally. No pixilation or artifacts. Nice creepy score by Michael Tomaselli. At times the bass was over-bearing, but for the most part, very good sound. No loss of dialogue. Lame one screen menu which lists the chapters and the DVD's one extra. The only extra is a 3 minute excerpt from Tomaselli's 23 minute short film on which this feature is based. I enjoyed the snippet. I wish the entire short film had been included. It would have made for a great comparison. This DVD cries out for a commentary track. EI NOTE: Tony Rullis, the film's associate producer also sent me a 5 minute extended trailer for Mr. Tomaselli's new film "Horror." I can't wait. Maybe Image Entertainment would consider putting out a special edition DVD with a commentary track, the full short film and this great new trailer! I had never heard of "Desecration" until Mr. Tony Rullis contacted me. I'm thankful that he did. "Desecration" is a personal work of highly personal and original terror. I am holding my breath for the release of Mr. Tomaselli's second film "Horror. Well worth the price of admission for fans of creepy movies. Watch EI in the coming months for what I hope will be a lengthy and in-depth interview with Dante Tomaselli.